Happy Birthday, Jack Kirby:The King of Comics! Jack Kirby (Aug. 28, 1917-Feb. 6, 1994) would have been 90 years old today. One of the best, most innovative, most imaginative artists the world has ever seen. 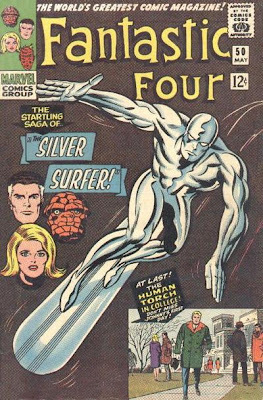 To honor his birthday, I'm leaving right now to go to a local theatre and catch FANTASTIC FOUR: RISE OF THE SILVER SURFER. Happy Birthday Jack. And thanks. EL Muerto DVD hits the cover of another trade mag! Over the weekend I stopped by a local comic book shop looking for some new books. I've been going to this store for years, and I don't think I ever asked them if they'd be interested in carrying EL MUERTO. I always get a weird vibe from the people there, for some paranoid/unfounded reason! But enough about that... So, I basically had a nice, incognito experience at this shop. Afterwards, I went across the street to a Border's Bookstore. I walk in and right away ask the guy at the info counter for a coin to use for their restrooms. He tells me I can pick one up at the cafe. As I walk away the clerk calls out 'Excuse me." I look at him thinking he found an extra coin or something. He says "Are you a writer?". I smile and tell him that I do a comic book. "El Muerto!" he chimes in. 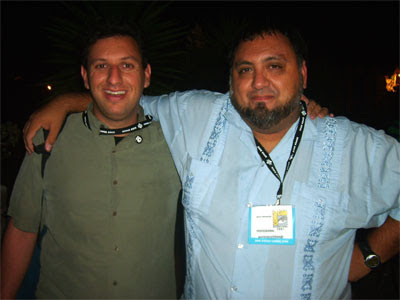 Turns out this fellow saw me at Comic Con back in 2005 when we showed the first teaser trailer to EL MUERTO. He bought the comics and got them signed by me and Wilmer at the signing after the panel. Juan Carlos is the guy's name. Very cool meeting a random fan like that. I told him that we had in fact just screened EL MUERTO at Comic Con last month. He told me he knew about the DVD release because they had recieved a trade magazine at his Borders with El Muerto on the cover! He asked if I had seen the magazine. I told him that I had to make it to the bathroom but if he could show me the mag when I returned I would appreciate it. So I get back from the bathroom and he hands me HOME MEDIA MAGAZINE. It's one of those trade magazines that are given to buyers at retail outlets so they can order the DVDs for their paricular stores. As I looked at the mag, Juan Carlos asked if I'd like to have it (I was hoping he'd ask!). Of course I took it, and thanked him profusely. Very cool to see the movie based on your comic plastered on the front page of a trade magazine! As I was taking these pictures earlier, it occured to me how very cool this is (I usually get that feeling concerning the whole movie experience!). 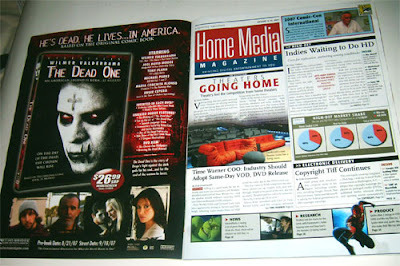 On the left side, taking up the inside front cover, is the ad for the DVD (retitled THE DEAD ONE, if you hadn't noticed). On the right side is the first page of the issue. On the far right corner of that page is a pic of Stan Lee (they're covering his appearance at Comic Con) and on the bottom right corner is a pic of the movie SPIDER-MAN. Pretty far out to think my own comic book character-turned film property, so much inspired by Stan Lee and Spider-Man, is sharing space in a magazine spread with them! I told Juan Carlos that is must have been trippy for him when he saw the magazine, as he was already hip to El Muerto. He informed me that he was indeed tripped out. We chatted a bit and he told me that he actually teaches at an elementary school. Not wanting to pass up a chance, I let him know that I've spoken at schools and wouldn't mind speaking at his if he ever wanted me to. I also asked him to let his store manager know that I could come back to the store and do a signing for the DVD! So, I walk in that comic shop and everyone minds their own business. I walk into a Border's and get recognition from a fan and the ad for my movie. See, I knew those people at the comics shop weren't savy on indie comics! 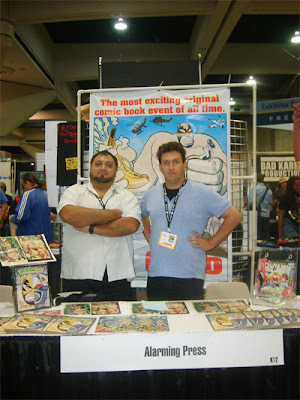 Monday morning I found out via my daily read of the comic blogs/news sites that comic book artist Mike 'Ringo' Wieringo passed away of a heart attack that he suffered on Sunday, August 12. At the young age of 44, and being a vegetarian and a guy who worked out regularly, his death came as a complete and terrible surprise to everyone. Mike had been a pro since the early 90s, becoming well-known for his stint on THE FLASH. 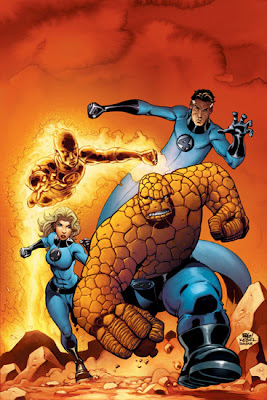 Over the years he worked on such characters as SUPERMAN, SPIDER-MAN, FANTASTIC FOUR as well as his creator-owned series TELLOS. I've known of his work for years, and was really glad to see him on FANTASTIC FOUR several years ago. His style was often called 'cartoony', as he drew the characters with an expressive, animated look to them, soft and lush linework that always contradicted the seemingly more prevelant 'dark and gritty' look that seems to be the fashion nowadays. He was a complete perfectionist, always wondering if his latest drawing could be better. But he had the utmost belief in the purity of true heroes, the classic superheroes that mean so much to many of us readers. His artstyle I always felt, reflected the innate fun that must accompany superhero stories. I never met Mike, nor wrote him any emails. But I would visit his blog occasionally, and marvel at the sketches he would frequently post. 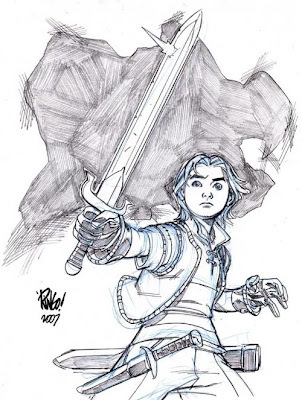 Poigniantly, the last sketch he posted, on Friday, August 10, was of his own comic book creation, JAREK from his TELLOS comic. How very touching to read the comments section to that post. The last time anyone responds to a new post of Ringo art. Monday, when the news had hit the internet, I noticed that several times during the day Mike's website/blog would be down. There were too many visitors to his site and that lead to the crashes. But reading various testimonials to Mike on different message boards or blogs, I am overwhelmed by just how much this man was loved. As an artist, because that's how he achieved his fame, but also a a person. So many people, mosty fans who may have never met him in person, have commented how genuinely nice he came across in his posts and whenever he would write to people. He'd often offer words of encouragement to young artists, or positive critiques of their art. His brother Matt has begun posting on Mike's blog, expressing his family's gratitude and general surprise on how big an impact Ringo had on people. The testimonials from his fans, fellow professionals and even convention organizers really makes me feel that a huge amount of loss has been felt from everywhere. What a beautiful testament to a person's life to see the type of impact his passing causes. What a horrible shame that the person passes away though. So sad to think that the communication he built up over the web now becomes a one-sided conversation. But that's one thing about comic book creators. While you won't find too many actors and sport stars talking with their fans online, comic book fans have great oppurtunities to communicate with their favorite writers and artists. And us comic creators that choose to are able to talk with our fans via our various web outlets. That's one thing that I think makes a very special connection between comic creators and fans. More direct contact than lots of other entertainment mediums. Even comic conventions give fans a chance to meet one on one with their favorites. Wieringo definitely had his share of comic conventions, and evidenced by the testimonies online, he was always glad to meet fans and spend time with them. My condolences go out to Mike's family and friends. If complete 'strangers' confess to breaking down over hearing of Mike's passing over the internet, I can only imagine what it's like for his parents and siblings to lose such a great spirit. A recent sketch of Mike's from his blog. 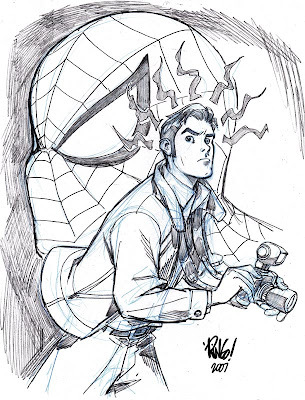 Peter Parker, a.k.a. Spider-Man. 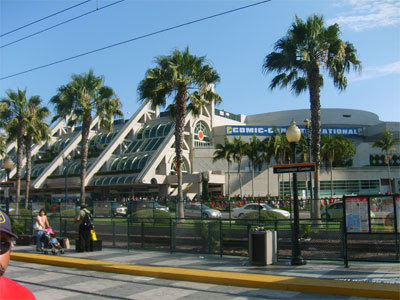 San Diego Comic Con report...Final wrap up! Sunday seemed to me to be just as busy as the other days I was there. 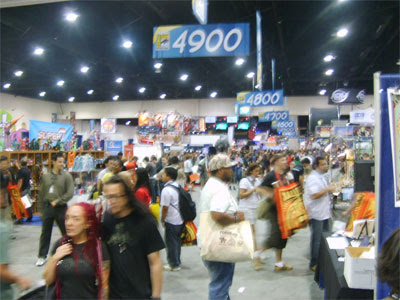 The same unending flow of humanity, the ocean of books, toys, collectables and movie promotional items.... In fact, because it is the last day, there seems to be a frenzy of last-minute rushing about the floor, trying to pick up those last items, visit some favorite artists, attend some final panels. For me, it was about revisiting my friends at their booths (to see how some survived the previous evening's dinner party), and meeting costumed superheroes. As I was just looking at this next photo, I suddenly realized that in my first year or so of attending Comic Con I had taken a photograph with a guy at the DC Comics booth dressed as Batman (at the time they were heavily promoting their recent BATMAN THE ANIMATED SERIES). 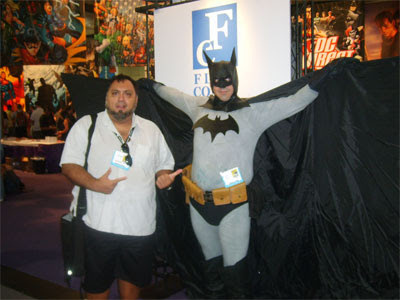 And here we are some 15 years later with me taking another picture with another guy dressed as Batman! 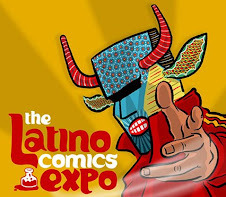 Only this time I'm promoting my film and have 10 years behind me as the creator of my own comic book character. Sure, this Batman may be a little heavier than the Batman of 15 years ago...but who am I to judge!? This next pic may be mistaken for a shaky photographer's hand, but I swear this is how I often see the show on a sunday (and this is without me having been there since wednesday as an exhibitor!). This shot was taken on the far end of the 'new' part of the convention center. They built this half about 3 or 4 years ago, to accomadate the massive influx of people who've been attending the show. You can't even imagine how long a walk it is to the other side of the convention hall. It's not so much the physical walk as it is the complete onlsaught of booths, displays, vendors, exhibitors, people and noises, color and hype that fills the cavernous hall! You walk across the floor and you see the Warner Brothers booth, an actual Mach 5 from the Speed Racer movie, a person selling original artwork they've created, another person selling their self-published comic book, a booth selling drinking glasses printed with superhero graphics, Simpson's creator Matt Groening being wisked by with an entourage of security, a sloppily constructed Captain America costume worn by a pudgy fan, and a battery of people lined up playing video games at another booth! You pause to take it all in then proceed to the next barrage of pop culture. Freaking unbelieveable, I tell you! Even in this 120,000+ person crowd I actually run in to the occasional fan, I'm glad to say. This gentlemen, Chris, I've actually had as a student in my Comic Book Workshop. He says I'm his 'art mentor', which makes me feel so old for some reason! But he's a great guy and he's a restless creative type, always exploring new types of art and music. Glad to be able to inspire someone in a small way, to be honest. I mean, if I wasn't inspired myself as a kid you wouldn't be here reading this blog! The book Sr. Nacho Libre is proudly endorsing belongs to the mad genuis, and treasured friend,Michael Aushenker!. Michael and I have been friends for a good 10 years or so. 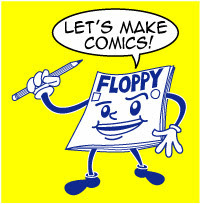 He was actally self-publishing his own comics for a few years when I had me him. We immediately hit it off, being attracted to one another's absurd humor (believe me, you need it to be in business of publishing your own comics for as long as we have!). Michael was making his return to Comic Con after a few years absense. It's funny, and a typical Michael observation, but since I was only there as a spectator for the weekend, Michael had commented that I still would find myself sitting at friend's booths behind the table! I just can't get the whole 'exhibitor' side of me to ever take a rest!! I hung out at Jason's table as well as Michael's for a break and a laugh. Eventually though, Bernyce and I had to make our way out of the building. As we left, I made last minute stopovers at various booths on the way out, just browsing for 'something' that might make it home with me. But the best thing I took home were the great batch of memories I made this year. Showing the EL MUERTO movie to a Comic Con crowd will certainly be one of the all-time great moments I've had in San Diego. And to be able to share the whole experience with this little lady is just the icing on the cake. 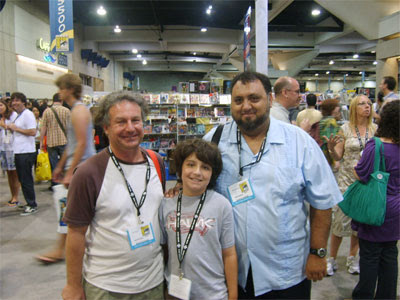 About 15 years ago, I had the honor of meeting Jack Kirby, the much-loved King of Comics, at Comic Con. He would pass away shortly thereafter in 1994. But my friends and I were hanging out at his booth, gawking at the artwork hanging off the walls. When all of a sudden, in walks Jack Kirby with his wife, Roz. Jack came over to talk to us (well, he talked we just kinda of muttered and stared!). He chatted with us briefly after giving each of us a firm, strong handshake. He looked around the hall, his hands calmly clasped behind his back. "This is a pretty big show," he told us all. "You should be able to find what you're looking for". Thinking back over the past weekend, the past 15 years of attending San Diego, I can honestly say that Jack was right. Friday night's EL MUERTO screening may have been the big highlight of the weekend, but it was by no means the only fun to be had. Saturday was a day filled with catching up with more friends and really just enjoying the show from the point of view of a fan, not just an associate producer of a comic book movie. Speaking of promoting movies, I think the 'buzz booth' of this years Con was the Weinstein Company's stunt to promote GRINDHOUSE. Here's a one-legged model dressed up as Cherry Darling! Now that's exploitation!! Not to be outdown, I was lucky enough to stroll pass this lovely lady. Miss Jessica Rabbit. Remember, she's not bad, she's just drawn that way! My friend Will Caulfield and his son Nicholas came down to the show on saturday. I've known Will some 22 years. He's a trusted friend and he actually gave me my start in a graphics art career. I was in college at the time, not really sure what direction I had wanted to pursue as far as art. He hired me to work part-time at the screenprinting shop where he worked at (he was the Art Director) and eventually I moved to full time. All the skills I learned their absolutely helped me later when I began to publish my own comic book. It was at that job where I actually first learned about computer graphic design. Some years later Will and his wife had their son, and Will left his position to raise Nicholas at home. I assumed the position of Art Director and a few years later, when we experienced a growth period, I was able to hire him back! So we have a long history of working side by side as well as becoming each other's boss over the years! A few years ago Will decided to create his own comic book ( THE ADVENTURES OF BAT BAT ) and he's attended a few shows with me as an exhibitor. He told me that I and my friends had inspired him with our own creations. And he tells me that his son Nicholas wants to create his own comic book! The two of them are hoping to attend Comic Con next year as exhibitors. That's a heck of a lot of circles being completed! Another good friend of mine exhibiting this year was Jason Martin. 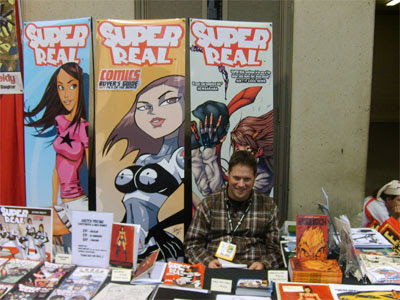 His full-color independent comic book series SUPER REAL has recieved a lot of favorable notices. Jason's probably the saviest guy I know, as far as us self-publishing cartoonists, who uses the internet to his full advantage as far as advertising and networking. He'll use a nice signature banner on various message boards he visits, for example, in order to drive traffic to his site. 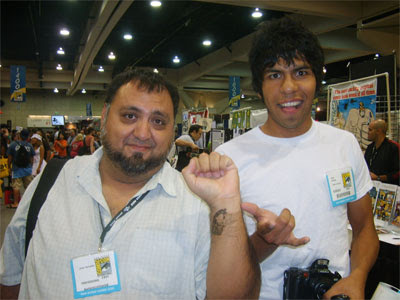 He and I met a few years ago in the Small Press area at Comic Con and hit it off really good. 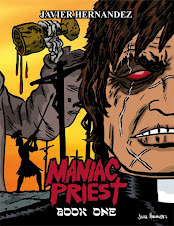 He's actually contributed to the El Muerto DVD release, but I'll have to talk about that in another post! By the way, Jason's got a very good blog where he in fact has his own Comic Con report with lots and lots of cool pics of the various booths and fans in costumes. Check it out right here! 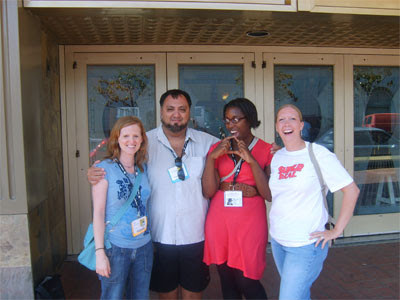 Comic conventions are about two things when you're self-publishing: Selling comics and befriending other cartoonists! 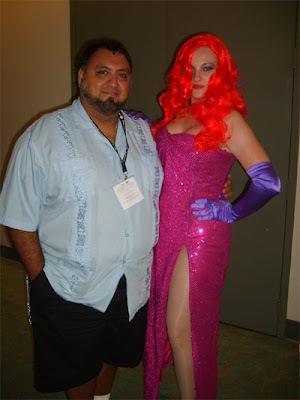 Here's Jose Cabrera, creator of the online strip CRYING MACHO MAN, and his lovely wife Naomi. 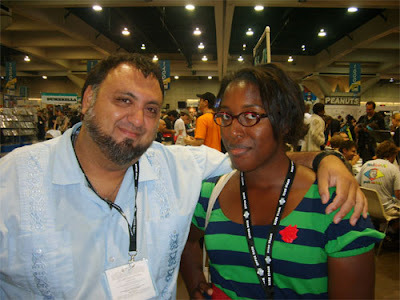 I met them about a year ago at APE (Alternative Press Expo in San Fransisco). They live in LA but so far we haven't had a chance to get together locally! We always hook up at some show or another. You'd be surprised how often that happens! Jose recently published a tradepaperback collection of his strip and asked me to write him a blurb, which is on the back of the book. He's got the blurb on his website if you want to read it. And while you're there, check out his comics and order his book! 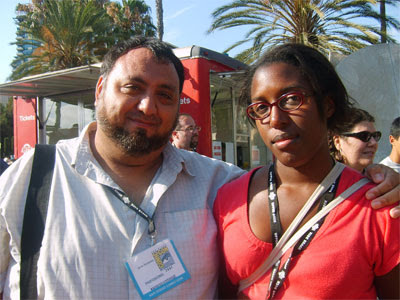 Speaking of being all macho and stuff...here's me and my girlfriend Bernyce. Often we wandered the floor together, but sometimes we'd go our own ways. There's only so much old-school, geeky superhero nonsense she can take! Although, she does have her own brand of comic book nuttiness she enjoys. We actually do have a lot of the same tastes in comics and art, but we also have enough differences to keep the two of us out of each others hair once in a while! Wandering the floor of the convention is always interesting because you never know what neat little book you're going to find or who you're going to run into. 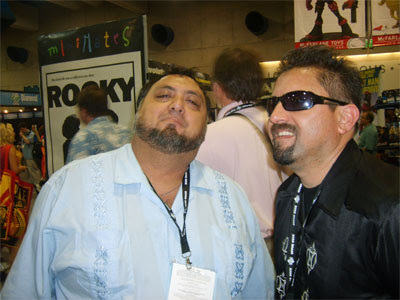 One such encounter was bumping into cartoonist and radio host, Lalo Alcaraz. 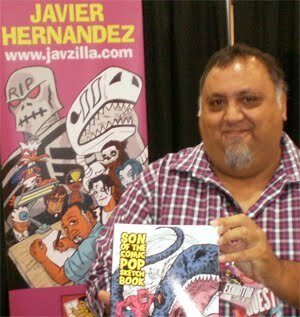 His strip LA CUCARACHA is nationally syndicated and he's been a strong supporter of my work over the years and a good friend. He was on a couple of panels invovling cartoon strips this past weekend. 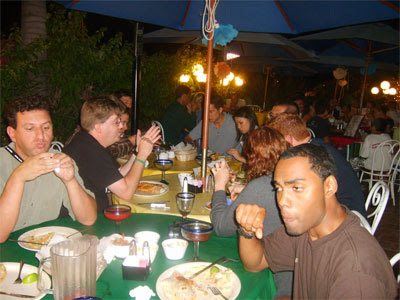 If friday's highlight was the movie screening, then saturday's highlight was the annual Mexican dinner in Old Town San Diego me and my friend Michael Aushenker started several years ago. To this day, believe it or not, I never remember the name of the restaraunt nor can I ever give anyone decent directions on how to get there! But every year we gather a bunch of friends and fellow cartoonists and take the trolley down to Old Town and enjoy a feast of good food and strawberry margaritas. Me and my co-Mayor of Margaritaville, Michael Aushenker! That Old Town dinner is always a great way to cap off a busy day at the Con. Regardless if I'm exhibiting there or just enjoying the Con as a guest, I hope this annual tradition continues for a very long time.